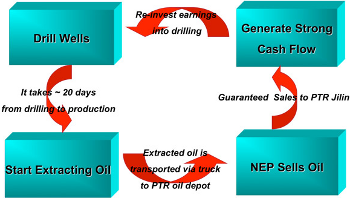 China North East Petroleum (NEP), with its innovative business model and flawless execution may be the most promising oil producer. Increasingly, governments are demanding higher prices from oil conglomerates for tapping into their onshore reserves and sometimes even excluding them in favor of domestic expertise. It looks bleaker and bleaker for Big Oil when you consider that in the 1970s, 80% of the world oil reserves were controlled by Big Oil companies, but now those numbers are reversed, with local government-owned oil companies holding 80% to 94 % of the block. Also, Big Oil profits stem from the dangerously thin margin between how much oil is produced on a daily basis, and what worldwide demand is. Clearly Big Oil's business model is due for a revision. Combining political savvy and business sense NEP leases oilfields from the Chinese government in exchange for selling all oil extracted to PetroChina at a fixed, below-market price and... the exclusive right to drill more! This tradeoff is what sets NEP appart from Big Oil: betting on China's insatiable thirst for oil NEP has re-invested earnings into drilling and achieved a 400% quarterly growth. Already traded on AMEX, NEP thrives with an unconventional business model adapted to today's geopolitical reality of drilling for oil.